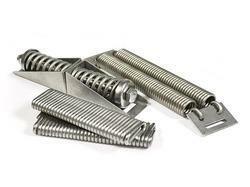 Prominent & Leading Manufacturer from Dadra, we offer ss mity spring and ss expansion spring. SS Mity Spring strapping is slipped through and back over the slots on one end of the flat bottom of the spring. The strapping is secured with a 3/4" closed seal and is extended around the object, or to the next spring, and the routine is repeated until the entire circumference has been encircled. 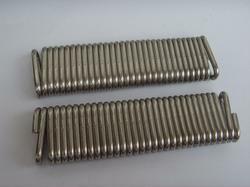 To accommodate expected expansion of the object, the number of Mity-Spring compression springs to be installed is based on a maximum compression of 1-1/2" per Mity-Spring. Install one Mity-Spring compression spring for every 25' of strapping. When tensioning the strapping, compress each unit a total of 1/2" (1/4" for each half of the spring unit). Extreme care should be taken to assure that spring compressionn and strapping stresses are evenly distributed around the object. Stainless Steel SS Expansion Spring is designed to secure insulation over large diameter insulated piping, vessels, tanks and equipment subject to expansion and contradiction. It can also be used with common width of strapping upto 19mm (3/4"). Standard length of spring is 50mm (2") and 100mm (4").